Federal scientists are planning to shoot a small number of barred owls they say are crowding out the threatened spotted owl in northern California - an experiment that could lead to killing thousands of the larger owls on the West Coast. Scientists said the "removal" experiment would be the best way to quickly determine whether barred owls are pushing spotted owls toward extinction. If successful, officials would then consider expanding the program. "This experiment is a small step," said Brian Woodbridge, a biologist for the U.S. Fish and Wildlife Service office in Yreka, Calif. The final plan was being discussed at a meeting of spotted owl experts Wednesday at Humboldt State University in Arcata, he said. The experiment could start as early as next week. Scientists said the northern spotted owls, which became a symbol of environmentalists' efforts to preserve the old-growth forests on the West Coast, are competing with the more common barred owls for nesting places and food. 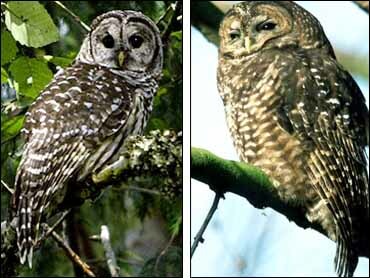 The barred owls, which have migrated to west from the Great Plains, also kill the spotted owls. There are no hard numbers on how many spotted owls or barred owls are in the West, but some estimates put spotted owls at about 8,000 pairs. Barred owls appear to greatly outnumber spotted owls in Washington, and are about even in Oregon, according to some estimates. The experiment site, in the southern Cascade Range, is bordered on three sides by mountains and contains only eight to 11 barred owls and 32 spotted owls, Woodbridge said. Barred owls have already displaced two spotted owl pairs and are crowding a third in the area. The California Academy of Sciences, which has agreed to take part in the experiment, already has permits from the Fish and Wildlife Service and the California Department of Fish and Game to shoot up to 20 barred owls for museum studies, meaning the experiment does not require a lengthy environmental impact statement. Some experts, however, say even if the experiment is successful, it will be hard to stop the migration of the barred owls. "Assuming you find removal is working - spotted owls move back into their territories - are you prepared to do that for the next 10,000 years? Because as soon as you stop you're right back where you started," said Eric Forsman, a spotted owl biologist for the U.S. Forest Service. The invasion also could have far-reaching ramifications for timberland owners, who log under habitat protection plans to maintain spotted owls. Some of those plans would allow more logging if spotted owls disappear; others could allow less. "This is creating a lot of anxiety for us," said Lowell Diller, a biologist for Green Diamond Resources Co., which owns 450,000 acres of timber east of Redwood National Park in Northern California. Susan Ash, conservation director for the Audubon Society of Portland, whose lawsuit resulted in spotted owl protections, said her group supports research, but has concerns about killing barred owls. "I don't feel we should just jump into something without getting a sense of the feelings of all the interest groups," she said.